A Bolder (Boulder) Gateway Canyon! Sunday hikes very often start out on one hike and end up with an interesting variation of that hike! Today was no exception. The scheduled hike was Krafft Mountain Loop. We assumed that this meant that any way one can hike a loop around the base of Krafft Mountain is allowable! One of our main objectives was to find out what Gateway Canyon looks like after the heavy rains and flood of two weeks ago. 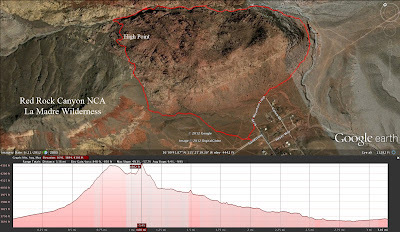 So, off we went from the dirt parking lot at the end of the Calico Basin residential area heading toward 5 Stop Hill. Seven hikers reached the saddle at the top of the hill and, after a small break, we began scrambling down the wash located close to the mountain on the right of us. 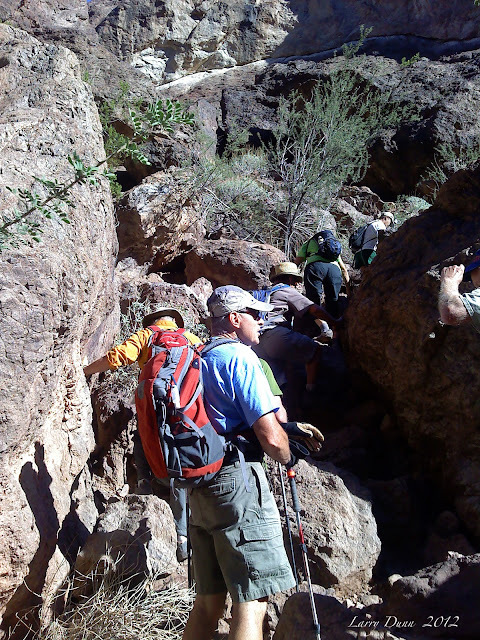 Usually, hikers utilize any one of many trails that lead down the hill to Gateway Canyon. Today, we decided that the wash offered a bit of adventure. It was a great scramble! Near the end of the wash, we turned right and scrambled up a stair-stepped chimney. This brought us up to the top of a calico level of Krafft Mountain. Views of Turtlehead and Gray Cap were very colorful in the morning light. Looking down toward Gateway Canyon, we chose our route. The candy cane calico sandstone led us all the way down a somewhat steep section of rock that our shoes adhered to well. Near the bottom of the hill, we came to the famous candy cane chute from the right side. Usually, we arrived there from the left side. 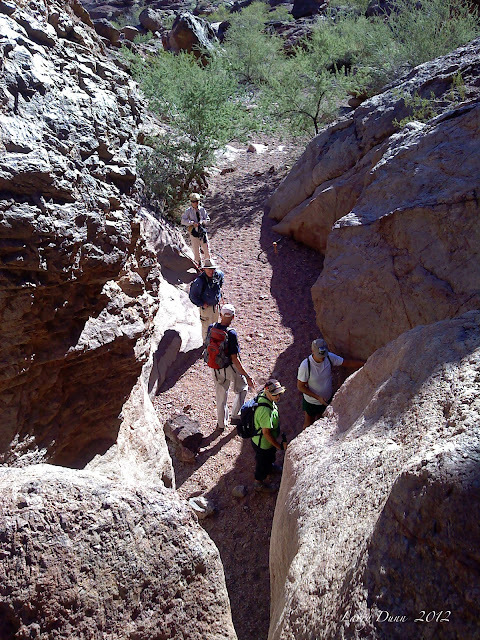 A few of us came down the chute, others down the adjacent rock slope, and we finally arrived in Gateway Canyon. Anxious to find out what the newly carved canyon had in store for us, we started down the gravel between the sandstone walls. Soon, we reached the same spot that stopped us two weeks earlier. There was still a large pool of water blocking the canyon. We sat for our snack break and then decided to try to find our way around this section without missing too much of the canyon floor. Three different routes were taken and then we were together again. Next, we arrived at the first large waterfall area. The easier route to the right of the huge boulders is the only possible way for hikers without ropes to get through. The photo below shows Don inside the hollowed out canyon floor below the oblong boulder blocking the route. By the way, Don said that the boulder moved slightly when he pushed on it from underneath. Beware! This Huge Boulder Actually Moved When Don Posed Here! Next, we came to a place where we normally just sat on a rock and used another rock to step down to the next level. Well, the two rocks are still there as before but the earth beneath has been hollowed out so much that the hiker cannot reach it without a considerable jump. Someone has begun placing rocks here to build up the "landing," however, the height was still not sufficient. The writer was able to climb down with a wrist-hold assistance from another hiker. Perhaps use of a rope is the best bet right now. In the photo to the left, the previous gravel level is clearly shown on the sandstone wall. All the way down the canyon, evidence of a tremendous amount of water flow is clear. We had to go up and around at the last large waterfall area mostly because of a pool of water still lying in wait at the bottom of the scramble area. At the end of the canyon, we found the usual trail out and hiked around the east end of Krafft Mountain to the dirt parking lot. A fun and informative Sunday morning. Gateway Canyon Chewed Us Up and Spit Us Out! 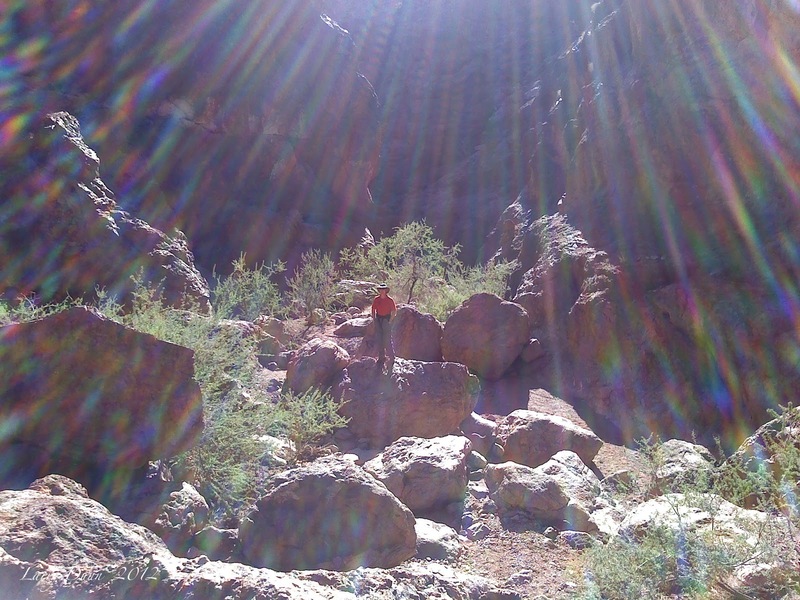 John Gonsalves offers his summit photo of Ice Box Canyon from today's 8:30am hike. There was water sliding down the waterfall area that was pooling at the base. The air inside the canyon was crisp and cool as we took our break. The relaxed paced hike was enjoyed by all. 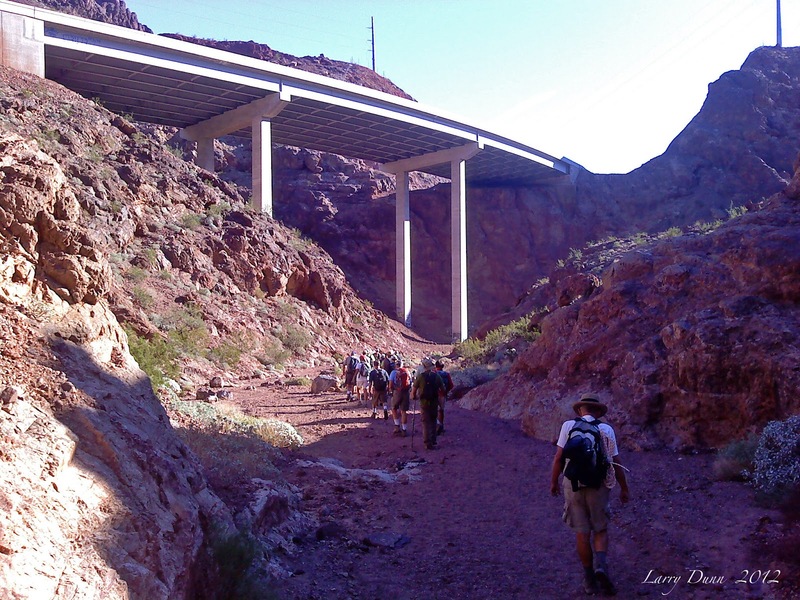 Thursday's hike was changed from Fern Canyon to Gold Strike Canyon two days prior in order for some of our hikers to experience the intentional yet unusual low water levels just below the dam. Larry provided the photos and John B. provided the video for which there is a link at the bottom of this entry. (You must copy and paste this link to find the video.) Both men also provided narratives for the hike and both narratives are given below in their entirety. Two perspectives for the hike and one summation. The hike was a really fun success! 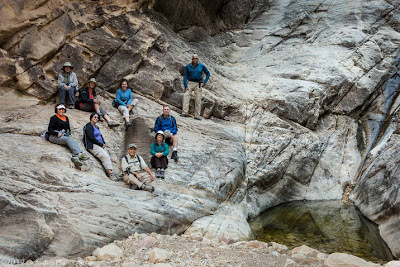 Twenty-one adventurous hikers took this rare opportunity to see the Colorado River at near-record low water level in Black Canyon below Hoover Dam. The Bureau of Reclamation, which controls the dam, has announced that to enhance the habitat for the endangered razorback sucker, a federally protected fish, it dramatically reduced water releases from Hoover Dam. 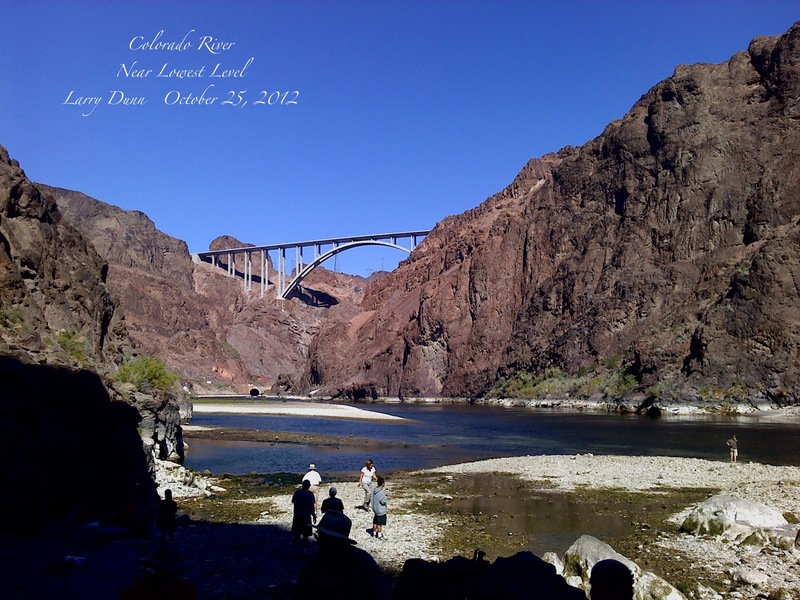 At the lowest point, the river level was almost ten feet below normal. This provided a rare opportunity to actually walk in the "dry" river bed from the mouth of Gold Strike Canyon past the Sauna Cave and almost up to the barrier cable that, in normal conditions, keeps boats away from the downstream side of the dam! This was an out-and-back hike to Gold Strike Canyon Hot Springs, also known as the Nevada Hot Springs, and on down to the Colorado River. 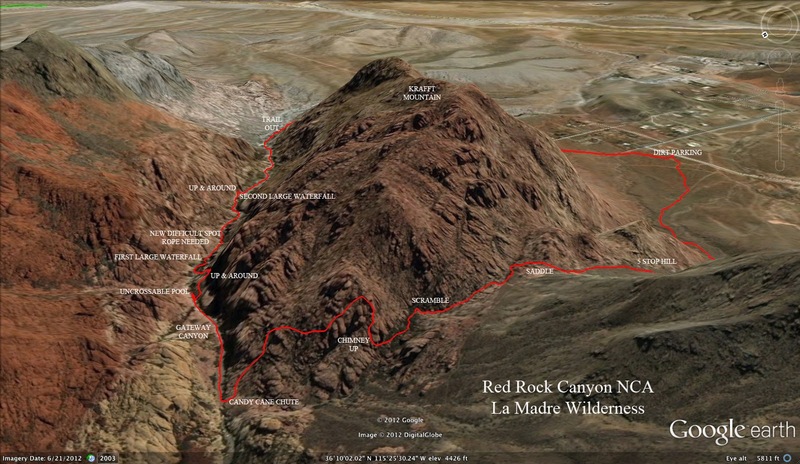 It followed a canyon just downstream from Hoover Dam. 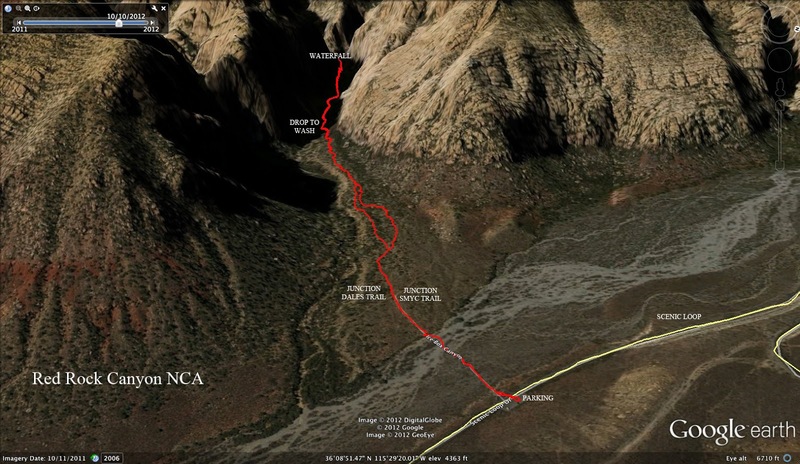 The route followed the drainage, descending over several minor waterfalls as it made its way toward a sizable area of hot spring fed pools. 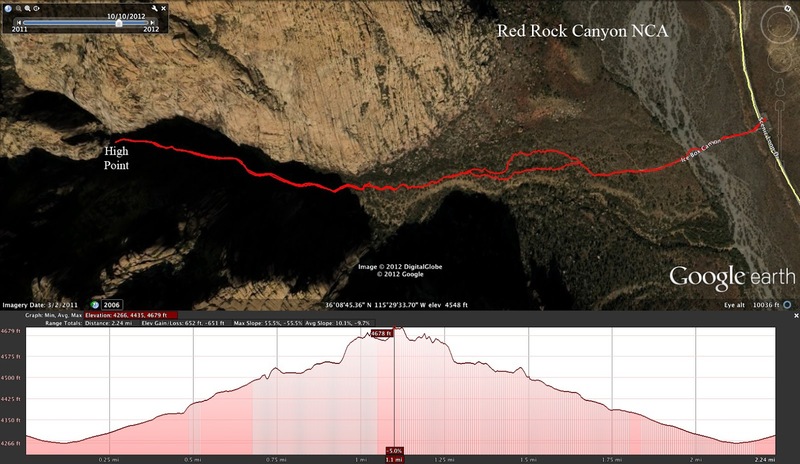 Total distance of the out-and-back hike to the pools is 6.2 miles with 800 feet of elevation gain on the return. The stretch of canyon past the pools going to the river is significantly more difficult. There were several slick, Class 3 sections that are assisted by static ropes. This hike is one of a kind. There are a total eight fixed ropes when you go all the way to the river. Some are difficult especially when coming back up. 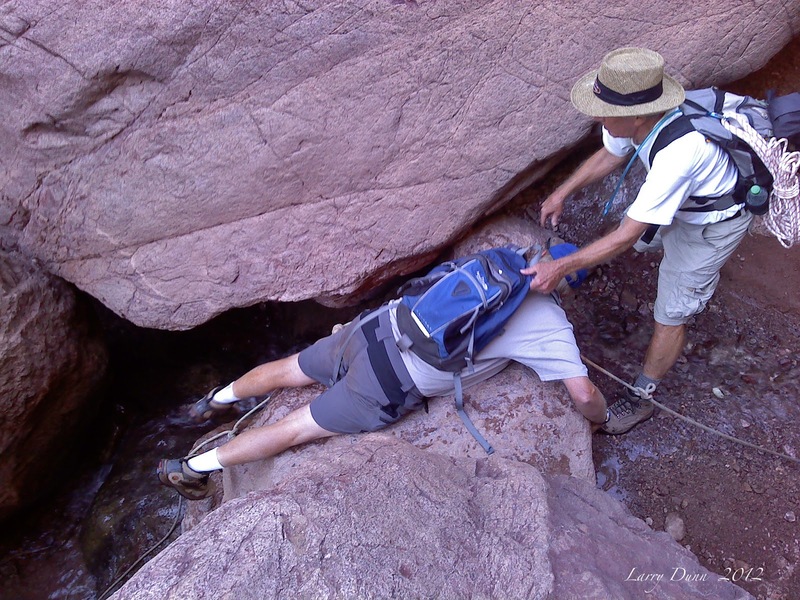 Although the drops are not that steep (3-4 feet), the ropes are especially helpful on the return trip. There are four obstacles to overcome before we reached the first set of pools. The first obstacle is a rock garden in which we maneuvered our way around a lot of rocks working your way back to the riverbed below. The second obstacle looks like a large boulder initially only seeing the drop-off until we noticed some small steps etched into the boulder. Then you merely climb down these steps, some are almost two inches deep causing one to decide which is stronger toes or heel. Some hikers went frontwards and some went down backwards. The next obstacle is a slide area where you choose to slide down a chute with about a 4-5 foot drop at the bottom or you can work your way around to the left side and gently climb down the wall. The final obstacle before the pools is a drop-off that curves to the right around a large boulder. It is somewhat of a leap of faith, as you cannot see around the boulder. Among these obstacles, it was somewhat like a hike in the desert where the wash opens up at times. After we cleared these obstacles, we arrived at the Upper Gold Strike Hot Springs pools. One must choose to go over a large boulder or down the wet waterfall. Not to worry, if you slip you either land in the hot pool on one side or the cold pool on the other. After leaving this area there are 4 fixed ropes, the last being the most difficult. 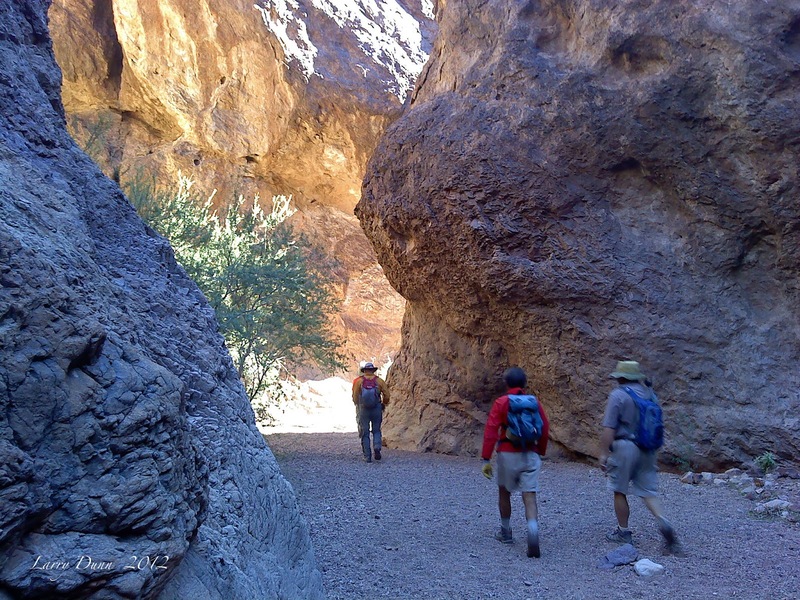 The last half mile to the river is one of the most scenic parts of the canyon. Very large walls that reach up to touch the sky. The warm water is constantly flowing in the stream and there are multiple pools and waterfalls. 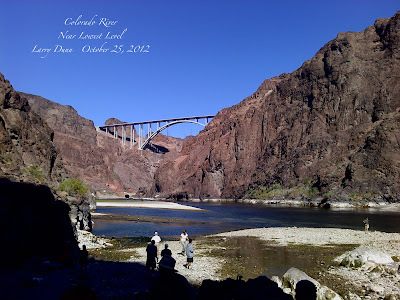 Soon we reached the mouth of the canyon and could see the mighty Colorado River. We sat near the river and took our much needed break. After munching down our goodies, we walked in the river to reach the gravel peninsula to our left. We had a good view of the new bridge with Hoover Dam located in the background. We worked our way over to sauna cave. The good thing about the river now is that the water was not very deep so we did not have to swim in 55 degree water. Sauna cave is located about 30 feet above the water at the end of this gravel peninsula. We soon armed ourselves with the brightest waterproof flashlights available and entered the sauna cave. The cave was about 130 degrees inside and we waded through the two foot deep water making our way to the end of the cave about 100 feet back. Without the flashlights, it is very dark as there is no light coming in. The moisture dripped from the ceiling of the cave as we reached the end. Returning from the end of the cave, we could soon see the opening of the cave, which gave a great view of the Colorado River. It was time to head back as we made a side detour to a heated cove area where hot water was spewing out from the wall. The water was so hot that we could not keep our hand in it as it would burn quickly. We could feel the hot water on the ground as it heated up our shoes. Now it was time to reverse our descent and head back to the trail head. Everyone helped each other as we made the climb up the ropes and up the canyon. Everyone felt that they had an adventurous hike and a really good workout using almost every muscle in our bodies including our brains.